Light can have a profound effect on all aspects of life — your mood, work and health. QUICK FIX: Make a big change in a little time. 15 minutes – Switch out a lamp shade or two. Try textured options, such as linen, to add interesting contrast, or spice things up with a color to match an accent piece. 30 minutes – Trade dimmers and switches for new smart-home options. This can be surprisingly easy, and can totally transform the look and comfort of a room. 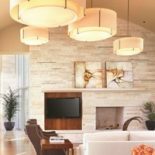 60 minutes – Install a new chandelier, pendant(s), sconces or other fixture. Depending on your level of DIY experience, this makeover may require the help of an electrician, but is not a complicated or expensive procedure. STYLE STATEMENT: Create your unique lighting look. If you have fallen in love with a particular light fixture that is too small for your space, simply hang two or three of them. Even some larger fixtures that could easily be hung as a single fixture in many spaces can be hung in multiples. Don’t be afraid to hang fixtures in clusters, even at varying heights if it suits your room. That’s the beauty and ease of creating your own style. There are no steadfast rules. To keep your decor from competing with itself and to make sure your fixtures are functional, efficient and on trend, it’s always a good idea to consult with a lighting professional at a lighting showroom. 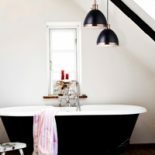 Your style statement will still be your own, but a lighting expert can suggest the best fixtures to achieve the look you want at the best price point. EXPERT ADVICE: Want more ideas? Ask a lighting professional. I have elderly relatives coming for an extended visit. What are some easy ways to adjust my lighting to make them more comfortable? Preparing for your older visitors by adjusting your home lighting is a great idea. As we grow older, our eyes change. Research shows that a 60-year-old needs twice as much light as a 30-year-old. With that in mind, it will help to set up special lighting for task areas before your older guests arrive. It is important to have light that you can direct, such as a pivoting or adjustable head on a task lamp. 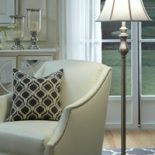 If possible, have a few table lamps or a torchiere that can be turned on while they watch TV. That will help reduce the contrast between the bright screen and the surrounding darkness of the room. Dimmers are ideal in the bathroom to add a bit of illumination to navigate during the night. That is helpful for people of any age. Do you have questions about lighting your home? Click here to submit your questions to a lighting designer.